On guard. - A Life From Scratch. The other day I was casually strolling through Heinen’s, picking out the perfect bulb of garlic when BAM! A woman – like, an adult! – sneezed ON B. I almost froze, like did this really just happen? To top it off, she was wearing scrubs. Like, hospital scrubs. Thanks for infecting him with whatever crazy illnesses you were a part of today. Awesome. Look, if you’re anything like me, you’ve had it with these germs. We had an awesome run, I really shouldn’t complain; but then too many weeks were filled with too many pediatrician visits, too many antibiotics (hate those things), too many sleepless nights (zzzzz), and too many of our dear friends sick. Not cool. I decided to attempt another action plan for my family. I do my best to keep everyone healthy with proper sleep + food + exercise + vitamin + flu shot. It’s a great start, for sure. But the bugs this year are relentless, and obviously our basic plan is just not cutting it. That’s when I did a little research and decided to come up with the healthiest chicken noodle soup I could possibly make. This one has it all: antibacterial, antiviral, antioxidant, and anti-parasitic ginger, vitamin C, vitamin B6, selenium and manganese packed garlic, anti-oxidant, anti-inflammatory, anti-microbial packed lemongrass, and lastly, anti-inflammatory antioxidant packed turmeric. All brightened up in a freshly chopped parsley and big squeeze of zesty lemon juice package. Hey, with the flu shot only being 20% effective this year (really? really? ), I’m going to go out on a limb and say this might even protect you better. And if you still end up sick (I’m so sorry), nothing will appeal to you more then a big bubbling bowl of this. Tea, a fire, and pj’s on the side. Heat a TBS of oil in a dutch oven/soup pot over medium heat. Add onions, leeks, carrots and celery and saute until softened, roughly 5-8 minutes. Stir in the ginger, lemongrass, garlic, and turmeric and stir until fragrant. Season with salt & pepper. 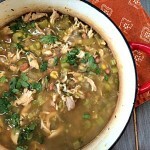 Pour in your stock and chicken and simmer together to blend flavors. Squeeze in one lemon and taste to adjust seasonings accordingly. I used a good amount of salt and pepper and added a touch more lemongrass. Right before serving, add noodles until soft. Pour into deep bowls and top with freshly chopped parsley. I can almost smell all those spices! Great iteration of a standard chicken soup. I made lemongrass chicken soup before (I found lemongrass in my regular grocery store where they sell fresh herbs, if someone was looking), and we all just loved it. It was one of the first recipes on my blog. I never made it again for some reason, though it was delicious. I will try this next time we are in the mood for a chicken soup. And yes, the yuckiest sick-season ever. Can’t wait for it to be over! I absolutely love lemongrass in broths – takes them to a whole other level! Hope you are enjoying your fun in the sun! Biz recently posted…Pizza Croutons? Um, yes please! Pinned your soup ~ I plan to make your soup this afternoon. Hubby has been down with the flu since Friday – he is getting better but it is a slow recovery – hopefully your soup will help. This soup looks like it would make anyone feel better. It has been so cold that this would keep you warm. We are all just getting over some pretty nasty colds in our house. I will try this next time. I need to make this for son. Right he is suffering from a nasty cold. Ah, hope he feels better soon and that the soup helps! 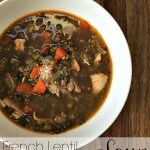 These spices sound perfect in this soup- thanks for sharing! I love this…so good and so healthy. And I like the addition of lemongrass. 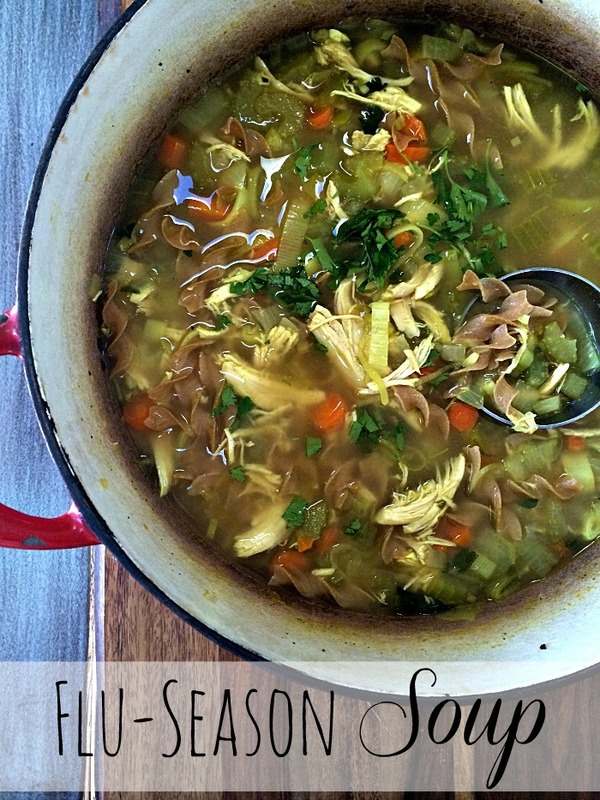 This soup sounds great for cold season! I will keep this recipe handy this season!! I’m in Florida and while the weather is fantastic, I’ve been dealing with sickies. I love a good chicken noodle soup recipe! That looks amazing! I’m trying to breathe it in from here! I’m really hoping to avoid the flu and any colds this year. I love a good soup for when I do get sick though. That one looks scrumptious! I love soup… it is one of my most fav foods. Great share! Thank you. Found you today via motivate me monday! Wow this recipe looks very yummy. Chicken soup is one of my favorites. wow, sounds like a good kick in the immune system, perfect to help you beat the flu. Thanks so much for sharing. This looks amazing! I need to be making this tonight! Hi Lorane, great tip on the Vitamin C. Thanks so much! Chicken noodle soup is such a comfort food when you are sick. What a delicious looking recipe. This soup sounds fabulous! I could use a bowl (or two) since I have caught yet another cold this month. Thanks so much for sharing at Simple Supper Tuesday. I remember being a little girl and having my mother give me chicken noodle soup, a grilled cheese sandwhich and flat ginger ale whenever I got sick. Oh the flat ginger ale is a great idea – love it! We seem to always have someone sick this time of year. This soup sounds perfect. I’m not feeling my best right now so this soup is for me. I love how it has garlic. My fave! Your soup looks absolutely wonderful, it looks so flavorful and delicious, filled with so many good things! There’s nothing like some hot soup when you’re not feeling well! 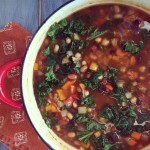 Echo recently posted…The Soup-er Recipe Link up! I would eat that delicious looking soup any season! Ah fresh lemongrass – what a gift. yes, you must make the soup now! 😉 Thank you so much for the invite! This is amazing!!!! 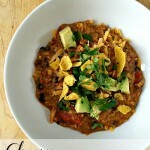 I love this combination–lots of ingredients I never would have thought of! I added cayenne pepper and kale to mine for some extra punch 🙂 Thank you so much for sharing! I’m so glad you enjoyed it!! Love your additions. The soup sounds good. Keep in mind that housekeepers, nurses aides and many others wear scrubs these days. I certainly hope no nurse would do such a thing.